The future for animals around the world starts right now. The giant panda cubs at Zoo Atlanta celebrated their first birthday in July. Fans from around the country flocked to see them, staking out their spots near the exhibit more than an hour before the party began. Guests wearing bedazzled panda shirts chattered about how long they had driven for the occasion, some coming from the nation’s capital, some local members of the zoo, and others from as far away as California. The two little girls they all gathered to see, Mei Lun and Mei Huan, are the first surviving set of giant panda twins ever born in the United States. Overall, they are the fourth and fifth cubs born to Zoo Atlanta’s seventeen year old Lun Lun, one of the most successful mothers of her species in the country. Much has changed since Lun Lun had her first cub in 2006. At the time, the birth was a relative surprise, but as technology and our general understanding of this species has advanced through research carried out by facilities like Zoo Atlanta, so have the medical and husbandry (to be defined in a future article) practices. The zoo staff works to monitor progesterone levels using urinalysis, identifying when the female is accepting to the male. While normally solitary animals, when she shows physical and behavioral signs of being ready to mate, Lun Lun and Yang Yang, the largest male Giant Panda in the United States, are placed on exhibit together. For just a few days, the two cohabitate, and during this time, the zoo staff may also artificially inseminate Lun Lun to ensure a pregnancy. For Giant Pandas, each pregnancy brings new hope for the species which is listed as endangered on the IUCN’s red list. With a decreasing population of only 1,600 individuals left in the wild, there are more visitors to Zoo Atlanta each day than there are pandas left in their natural environment. Just a couple of days before the twins’ birth, Lun Lun participated in an ultrasound, one of the voluntary behaviors that her keepers have trained often with sugar cane rewards, allowing staff members to confirm that the big day was approaching. On July 15, just after 6:20pm, Lun Lun gave birth to two hairless, deaf, and blind cubs that were each no larger than a human’s hand. In the wild, if twins are born, the mother panda generally chooses only one to raise, but, at Zoo Atlanta, the team sprang into action. Newborn pandas are helpless at birth. In fact, not only are they unable to see, hear, or walk, but their bodies also lack the ability to regulate their own temperature and are around nine hundred times smaller than their mother! Therefore, during the first several months of life, the mother panda cannot take her attention away from her cub. About 80% of her time will be entirely dedicated to nursing, grooming, or just holding her cub. That’s some pretty intensive care! In order to give Lun Lun the ability to focus on one daughter at a time, as well as increase the chances of survival for both cubs, Zoo Atlanta staff members took care of one newborn, keeping her warm in an incubator, while their mother took care of the other. Until they started walking on their own, the keepers switched cubs every couple of hours to make sure that Lun Lun bonded with both of her offspring. During most of this time, the staff had not yet bestowed names on the cubs, simply referring to them as Cub A and Cub B. According to Chinese tradition, good luck is given to those named on their 100th day of life, and so the zoo held off on naming them until that time. Prior to Zoo Atlanta’s naming ceremony, thousands took part in a public online poll, voting on idioms that represented the two little bears. After the tallies were counted, the Chinese government approved the winning phrase, “Mei Lun Mei Huan”, which translates to “something indescribably beautiful and magnificent”. The twin girls share the phrase, each taking one half as their name. Baby photos detail the twins’ milestones. Just as celebrators poured into the zoo that day, the same can be said of the festive day in July when Mei Lun and Mei Huan turned one year old. 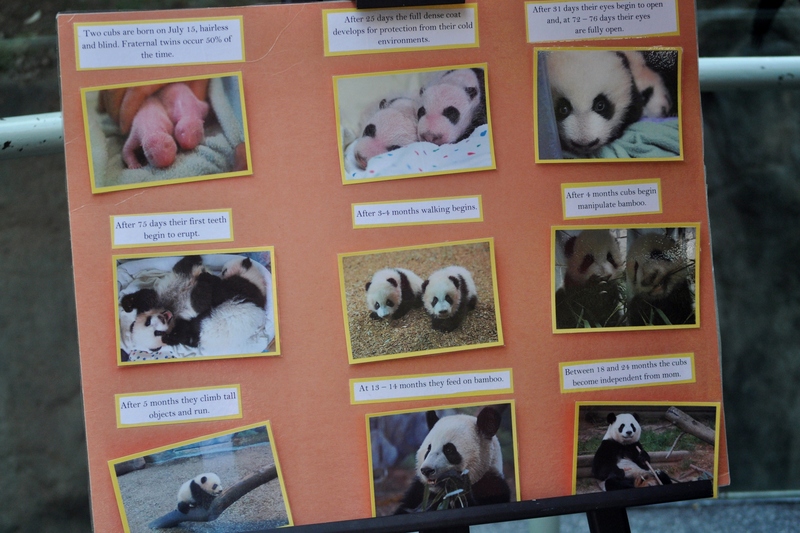 Their keepers took the time to share the panda girls’ first days with visitors via television screens and posters displaying baby photos from the past year. 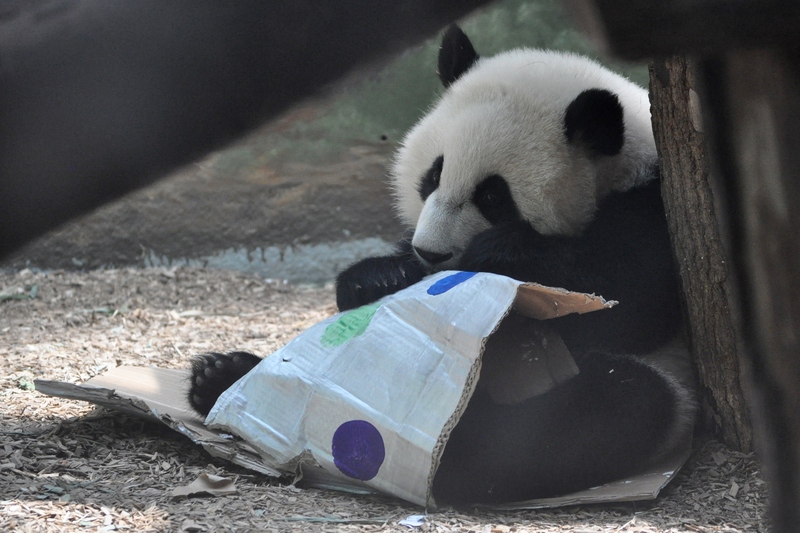 Inside the exhibit, they set out ‘birthday presents’ in the form of colorful cardboard boxes with treats inside, which mother Lun Lun promptly opened and ate. The twins eventually got the idea and played along. Unaware of the pandamonium (sorry for the pun, but I had to do it) they have created, Mei Lun and Mei Huan spent their day sleeping, climbing, and playing as their mother kept a watchful eye while chowing down on bamboo. They will wean from their mother when they are around a year and a half old, as did their three siblings before them. And, like their siblings before them, they will eventually board an airplane and make the trip around the world to China’s Chengdu Research Base of Giant Panda Breeding where they will, hopefully, become mothers and have cubs of their own. While Zoo Atlanta is one of only four zoos in the country that house and breed giant pandas in collaboration with the Chengdu Research Base of Giant Panda Breeding, their efforts to preserve this species doesn’t end there. One of the greatest threats that this species faces is habitat destruction and loss. Roughly forty percent of appropriate habitat for pandas lies in nature reserves in three provinces in China. The Chinese government has begun to add almost 70,000 planned square miles to the reserve system in an attempt to help their national treasure’s population, and funds from Zoo Atlanta support eight different nature reserves. In fact, Zoo Atlanta has been working with the Chengdu Research Base of Giant Panda Breeding since the early 1990’s, assisting in research that focuses on mothers and cubs. 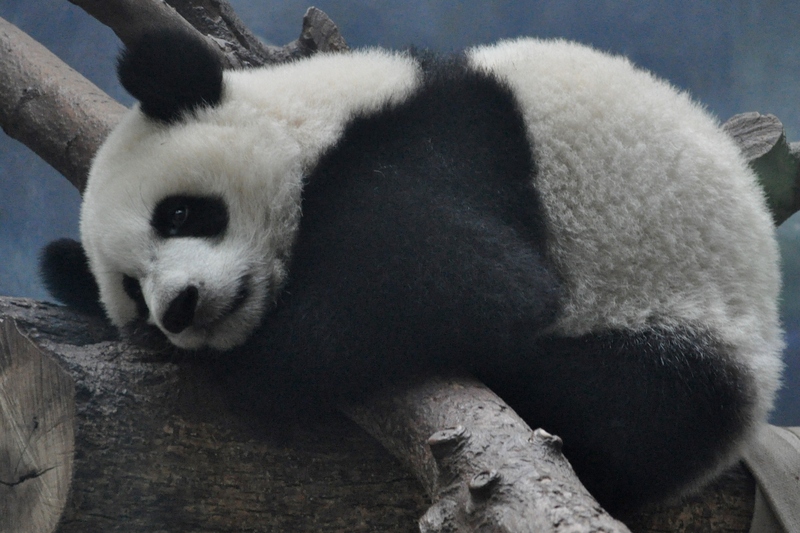 The panda research and breeding program is Zoo Atlanta’s most expensive conservation project. As this zoo in Georgia has demonstrated, regardless of the distance between you and the giant panda’s homeland, there are actions that you can take to help them. One of the ways to do that is by adopting a panda. Of course, this is a symbolic adoption. You wouldn’t want one of these bears in your own house- the estimated cost for caring for one of these animals totals at around $10,000 a year! Your donation contributes to conservation projects at Zoo Atlanta and across the world! For a limited time, you can actually sponsor Mei Lun and Mei Huan specifically! Another way to help pandas is by visiting Zoo Atlanta and other facilities that support or house this rare bear. Every time you visit a zoo, you support research and conservation efforts like the one you’ve read about today. 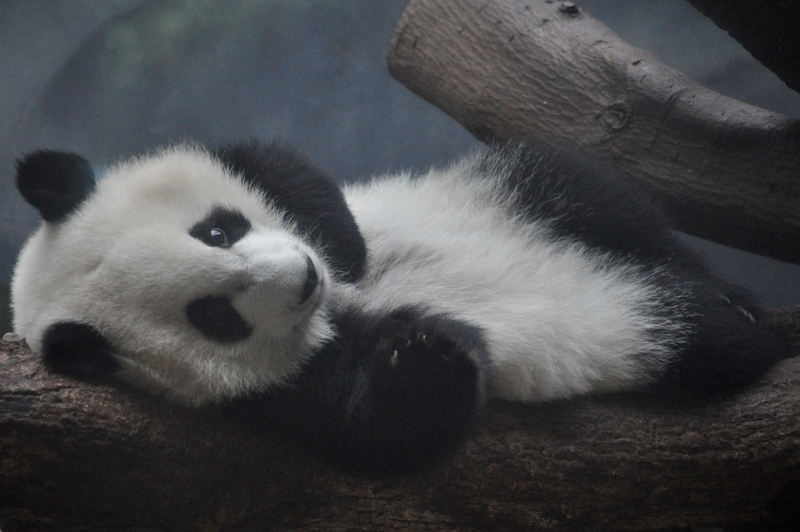 Zoo Atlanta continues to look forward to a bright future for giant pandas. The staff is currently preparing for Lun Lun’s next pregnancy and the celebrity twins’ next steps in life. Keep track of the panda family’s updates through the Zoo Atlanta Panda Blog, written by the keepers who work with these bears every day. Congratulations to the team for all of their hard work over the past year. 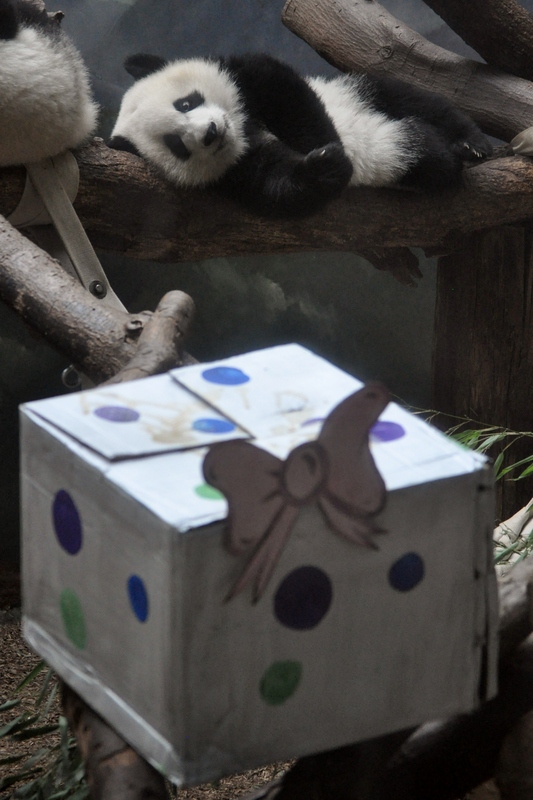 And, of course, happy birthday Mei Lun and Mei Huan! Here’s to many more! Mei Huan eyes one of the birthday presents. We can’t say it enough- Thank you for visiting Zoos Are Important!